Here’s a great recipe for Junior Mint brownies care of the amazing bakers at Cooking Light. To go that extra mile, decorate the top of the brownies with more Junior Mints as soon as the brownies come out of the oven. Then, package them up and send them to me! Posted in Childhood memories, Cookies, Dark Chocolate, Minty. Bookmark the permalink. So if I live in the Boston area and I eat these that that means I am a Locavore! Does that also make them okay for macrobiotic diets? 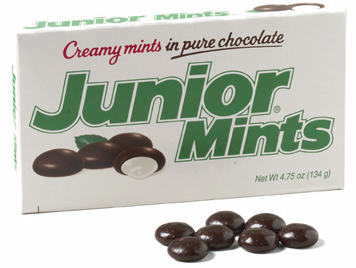 And another question…I always associate the most excellent Milk Dud as being the sibling candy to Junior Mints. Are they made by the same company? and if so, that makes being a Locavore even more appealing…Good for the local economy and O so Good for U!